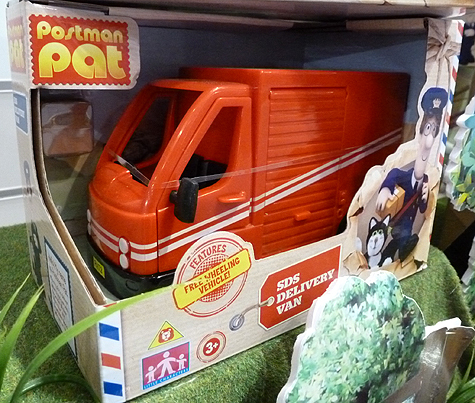 Pat 2 is Postman Pat’s new larger vehicle the Special Delivery Service SDS Van. Pat 2 is a much larger box van with side opening roller door. The classic red livery is kept but white decals have been added along the side and front. SDS Pat 2 features opening doors, push button sound effects and comes with two parcels ready for delivery. 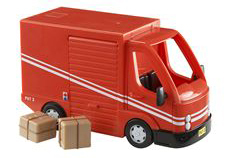 The Ted Glen’s Garage and SDS Sorting Office Playsets have leads which connect to the SDS Pat 2 van. In 2013 Character released a repackaged version of Pat 2.